This was fairly simple, I found a $1 passport sticker book at the Dollar Tree that included photos of flags. So I cut out each flag and attached it to a toothpick. Tip: You can print out colored flags on your computer. 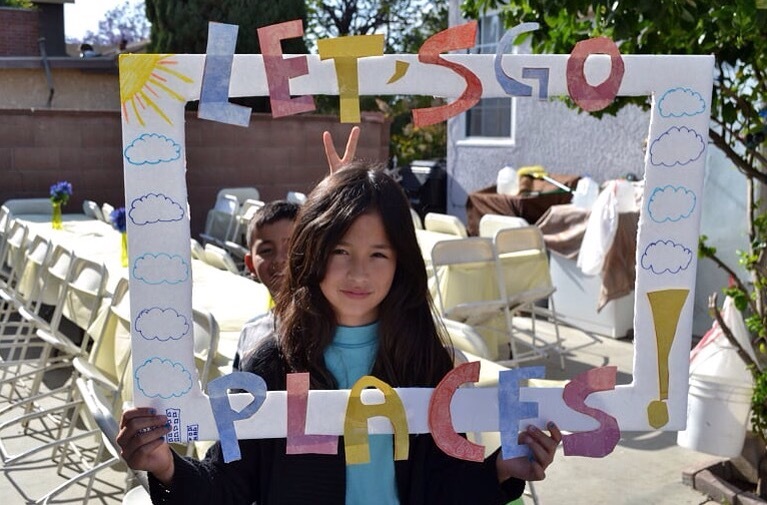 All you need here is : large maps + foam poster boards + construction paper + anything glittery or shiny. 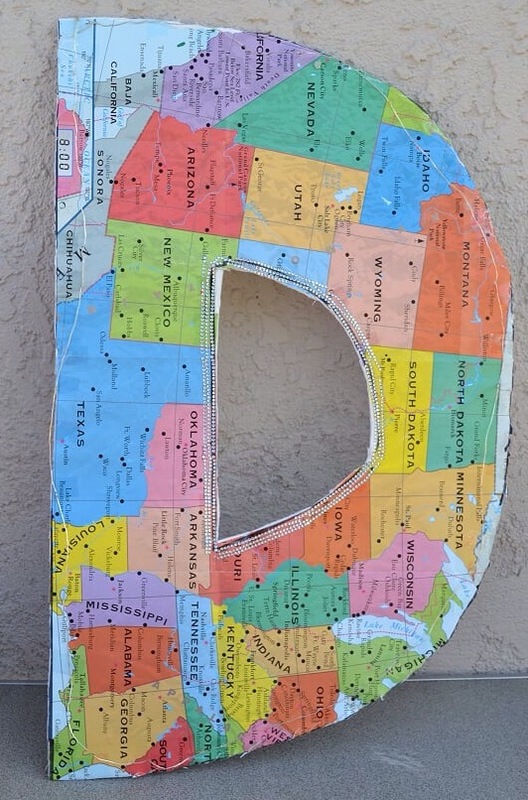 For my first personalized item I cut out the foam board into a “D” shape for my name, then I layed the map on top and cut and pasted until it for the foam board perfectly. Tip : Add fairy lights so you can light them up at night. You can purchase these on Amazon. For my second personalized item, I didn’t cut the foam board, I just attached the map to the board as is and used my construction paper to spell out a cute quote. Then I added shiny beaded stickers on top of the lettes to help themstand out. Tip: I also added fairy lights to this poster board. 4. Photo frame for pictures. Photo booths are too expensive so I decided to go with something affordable and original. I got a foam poster board and cut it into the shape of a frame. Then I used my construction paper to attach a cute and simple phrase anyone can relate to and decorated. You can go many ways with this. While shopping I came across these cute flowered Parisian themed boxes. I though these would be cool for my candy table. However, these can be used for almost anything you’d like including a place to set candles. This is for parties with assigned seating. 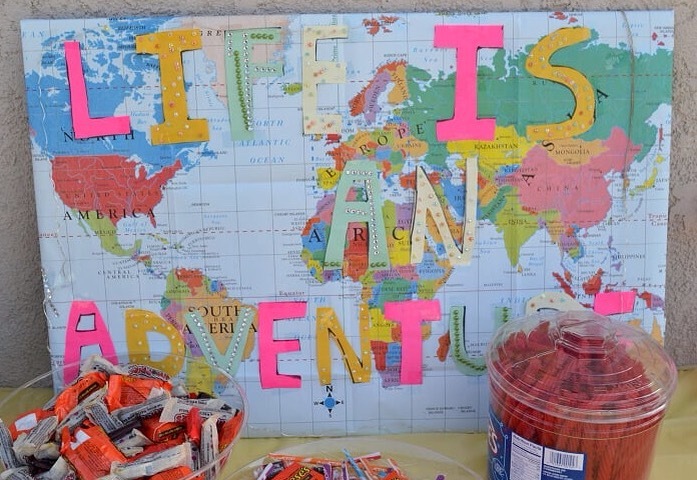 It’s a cute way to make your guests feel special and get them feeling your travel vibe. Hope you all enjoy these decor tips! 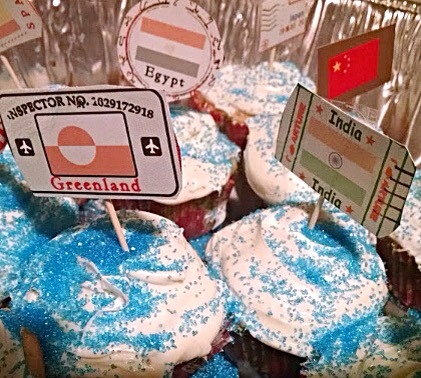 These are cute ideas for hosting a travel theme party. I especially loved the photo frame for pictures. I think these ideas are great for kids and with a little tweaking would be fun for adults as well.